Land degradation is categorized into three types i.e. (i) Physical degradation (ii) Biological degradation (iii) Chemical degradation. Physical degradation refers to deterioration in physical properties of soil whereas biological degradation refers to reduction in soil organic matter, decline in biomass carbon and decrease in activity and diversity of soil fauna. Chemical degradation is basically due to the nutrient depletion. Degraded land includes eroded lands, saline / alkaline lands, water logged lands and mined lands. The total land area of India is 329 million hectares of which about 178 million hectares (54%) is converted into wastelands for one or other reasons. This also includes about 40 million hectares of degraded forest. The total cultivable land of the country is about 144 million hectares of which 56% (80.6 million hectares) is degraded due to faulty agricultural practices and the dense forest cover has been reduced to 11% (36.2 million hectares) of the total geographical area. Watershed areas, river corridors and rangelands have been extensively disturbed. Situation is frequently so bad that even cessation of abuse may no longer lead to self restoration of biological diversity, stability and productivity of the ecosystems. In India about 25% of the land area is suffering from the problem of water erosion. Soil erosion by water in the form of rill and sheet erosion is a serious problem in the red and lateritic soils of South and Eastern India where about 40 tonnes per hectares of top soil is lost annually. Out of 70 million hectares of the black soils of Central India about 6.7 million hectares are already unproductive due to development of gullies. Over 4.4 million hectares of land is degraded due to shifting cultivation practiced largely by tribals in North-eastern India. Ravines are system of gullies or gorges worn out by torrents of water running more or less parallel to each other and draining into a major river or its tributaries after a short distance with development or deep and wide gorges. In fact ravine lands are manifestation of extreme form of water erosion occupying approximately 3.67 million hectares of land chiefly distributed in Uttar Pradesh, Madhya Pradesh, Rajasthan and Gujarat. It has been estimated that the production potential of ravine areas in Uttar Pradesh, Madhya Pradesh and Rajasthan alone would amount to 3 million tonnes of food grains annually besides fruit, fodder and wood. On a conservative estimate the country is losing a total output worth about Rs.157 crores a year by failure to reclaim and develop the ravine lands. Furthermore, these ravine lands have been creating problem of law and order maintenance in states of Uttar Pradesh and Madhya Pradesh as the notorious dacoits take refuge in these eroded lands and conduct their unlawful activities. Wind erosion in chiefly the problem of arid and semi-arid regions of the country where the soil is sandy with scanty vegetation or even without vegetative cover. In India about 50 million hectares of land area is affected from wind erosion most of which belongs to Rajasthan and Gujarat. The over-grazing is the main cause of soil erosion in these areas. It is estimated that a programme for the control of wind erosion covering 50 million hectares would cost about 3,000 crores of rupees. Approximately 140 million hectares land area of the country is affected from water and soil erosion as a result of which the top fertile layer of the soil is lost annually at the rate of 6,000 million tonnes per year containing more than Rs.1,000 crores worth of nutrients. The amount of macronutrients like nitrogen, phosphorus and potassium (N, P & K) lost during this process is about 5.53 million tonnes. Population explosion, intensive cultivation, industrialization, urbanization, deforestation, over-grazing, shifting cultivation, mining activities are the chief causes of land degradation in India. Besides these, modern agricultural practices are also the cause of land degradation. The advent of Green revolution in mid sixties has led to increased use of chemical fertilizers and pesticides which has not only polluted the atmosphere but also has caused an significant decline in floral and faunal population of the soil, which are responsible for the maintenance of soil fertility. This has resulted in a decline in land productivity. Over use of nitrogenous fertilizer urea has caused the acidification of the soil. In acidic soil elements like phosphorus, copper and zinc are unavailable to the plants. At the same time acidic soils are generally poor in macronutrients like calcium and potassium. Thus the ultimate result is loss in production potential of the land. Indiscriminate use of inorganic fertilizers destroys the soil structure in which the soil particles are aggregated together into crumb consequently the soil becomes prone to erosive forces like water and wind. Excessive use of water for irrigation practices has caused the soil salinity / alkanity as a result of which fertile lands have been converted to usarlands (salt affected soils). 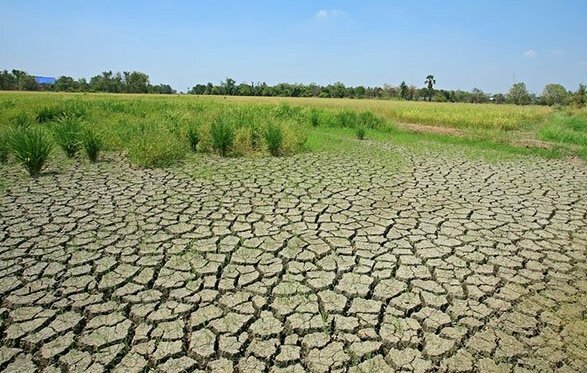 About 6 million hectares of land area is affected by water logging and about 7 million hectares is salinized / alkalinized due to faulty irrigation practices. Approximately 40% of the salt affected soils occur in Indo-Gangetic Plain extending over Hariyana, Punjab, Uttar Pradesh, Bihar and Delhi. In saline / alkaline soils the high concentration of salts, lack of moisture availability, poor permeability, toxic effect of sodium ions, high alkalinity and nutrient disorders are important factors inhibiting plant growth. It can be concluded that land degradation is a serious problem in India which need to be tackled because shrinking of land resource base will lead to a substantial decline in food grain production which in turn would hamper the economic growth rate and there would also be unprecedented increase in mortality rate owing to hunger and malnutrition.